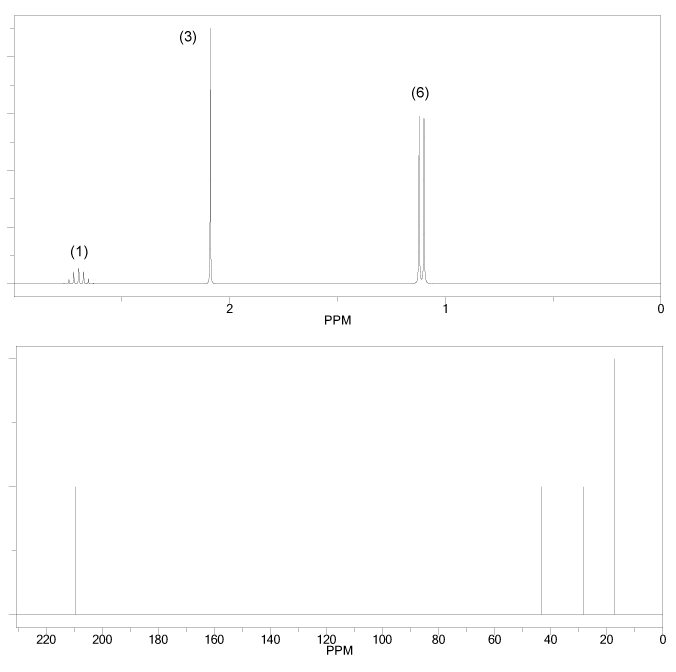 The 1H and 13C NMR spectra of an unknown compound are shown below. The compound's mass spectrum shows a molecular ion with m/z ratio of 86. Determine the structure of this compound. This is a difficult problem because we are never given the compound's molecular formula, only its mass (the molecular ion is the mass of the compound). So first, let's make a guess of this compound's molecular formula. 1O is 16. Mass is 86. 86-16 - 70. That's the total mass of C's and H's we have to work with. How many C's can we "fit" in 70? 6 C's would be 72, so let's try 5 C's. 5 C's is 60, so we need 10 H's to make 70. So a formula of C5H10O has the correct mass. It also has the correct number of IHD (1). So let's go with it. We sort of did this step already, but yes- this molecule contains an aldehyde or ketone. Since we don't see a singlet at ~10 ppm on the 1H NMR, it can't be an aldehyde. So it must be a ketone. 2. How many IHD are there? (also known as DBE or degrees of unsaturation). C5H10O is the same as C5H10 (ignore oxygen). C5 would be C5H12 if fully saturated (because of CnH2n+2), so this molecule is missing 2 hydrogens, which corresponds to 1 IHD. 3. Draw some C5H10O structures with 1 IHD and eliminate, learn, repeat. There's a doublet with an integration of 6, and a multiplet with an integration of 1. This screams isopropyl group. That singlet with an integration of 3 is probably a methyl group. As mentioned above, since we don't see the aldehyde proton anywhere, the carbonyl must be a ketone. Now draw a few candidate structures based on these clues and eliminate those structures that don't fit the data. If anything doesn't fit, you must elminate the entire structure. 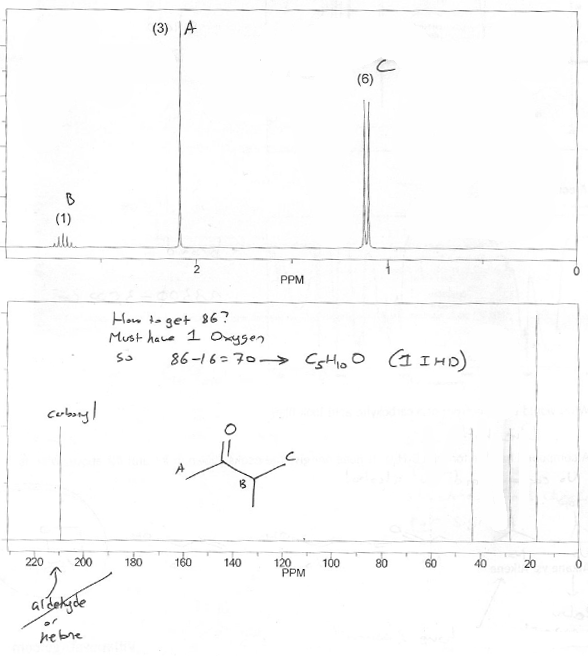 These (no molecular formula, only MS data) are the hardest kinds of NMR problems you'll get in sophomore organic chemistry, so don't worry if you find it challenging- you're supposed to. MendelSet practice problem # 665 submitted by Matt on July 18, 2011.